Like most common names, "American March Brown" can refer to more than one taxon. They're previewed below, along with 5 specimens. For more detail click through to the scientific names. These are often called American March Browns. In the East and Midwest this is one of the most important hatches of the Spring. They are large flies which emerge sporadically, making for long days of good fishing. This species contains the two classic Eastern hatches formerly known as Stenonema vicarium and Stenonema fuscum, the "March Brown" and "Gray Fox." 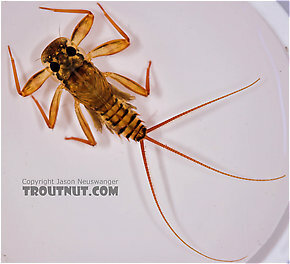 Entomologists have discovered that these mayflies belong to the same species, but they still display differences in appearance which the trout notice easily. Anglers should be prepared to imitate both types. Female Maccaffertium vicarium (March Brown) Mayfly Spinner View 7 PicturesI collected this mayfly on the same trip as a male of the same species. 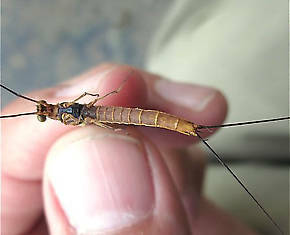 They are Maccaffertium vicarium mayflies of the type formerly known as Stenonema fuscom, the "Gray Fox." These are very rarely called American March Browns. 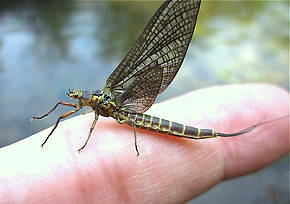 Litobrancha recurvata is generally reported to be the largest North American species of mayfly in angler entomologies, though this understanding is being challenged by reports of Hexagenia limbata that may exceed 40mm in some locales. Regardless, it is certainly the largest mayfly in the region of its distribution. Sometimes it appears together with species of Hexagenia or Ephemera, but in other places it creates excellent action on its own. Female Litobrancha recurvata (Dark Green Drake) Mayfly Dun View 2 PicturesThese photos were contributed by Spencer Vanderhoof. Male Litobrancha recurvata (Dark Green Drake) Mayfly Spinner View 1 PicturesThese photos were contributed by Spencer Vanderhoof.